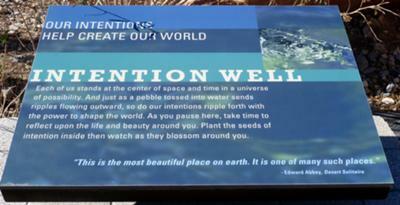 We toured Red Rock canyon and this wonderful thought on Intention was at the visitor center. They are in the midst of remodeling the Red Rock Visitor Center.. and it is quite beautiful. Anyways, I love this... What are your INTENTIONS for retirement? porch swing in the sunshine? OR something bigger and better? Consider an intention in some area where you might make a difference in life! We still need goals and intentions in life... we can't simply exist as bumps on a log (until we are among the old-old and we can rest more in life). This is a beautiful reminder that YOUR pebble might just ripple out and affect many others, if only you'd let it. Join in and write your own page! It's easy to do. How? Simply click here to return to Las Vegas Blog.